This post is about one of my favorite topics – healthified party food. Why is party food always so freaking heavy? My guess is that party-planning is so stressful for most people they use time-tested favorite recipes and old stand-by’s to make sure that their guests are happy and satisfied. Well, I am out to change that. Let’s lighten it up and not LOSE any flavor. My husband and I were recently lucky enough to get invited to dinner at another food blogger’s home. Now, when food bloggers get together to serve each other food, there is a certain amount of pressure that naturally ensues. Par for the course, right? My friend went all out, delivering a decadent and delicious meal appropriate of any food blog worth its salt. She served a Filet Mignon with a Red Wine and Mushroom Sauce, Souffléd Mac & Cheese and Caesar Salad (with both homemade dressing and croutons, of course). It really was a perfect Fall dinner with even more wonderful company! She told me ahead of time that she was planning a rich meal and since I was going to bring a starter, I wanted it to be light for balance and still pack a punch of flavor. This easy little bite is a perfect example of what party food can be. Delicious, light, complex, easy and accessible. I combined the crunch and sweetness of sweet, baby bell peppers with some wild-caught Oregon Pink Shrimp (which by the way, usually come already cooked) lightly tossed with my Lightened Up Basil Pesto, a drizzle of olive oil, a squeeze of lemon and a bit of crushed red pepper flakes. A perfect 1 Point party bite. If you don’t have access to Wild Oregon Shrimp, ask your fish person for sustainable, tiny shrimp. They usually come cooked, which is a major time saver. If you can’t find that substitute, get the smallest sustainable shrimp you can (hopefully already peeled and cleaned), quickly boil, roughly chop and let cool a bit before using). Or, buy online at Vital Choice and have them delivered. If you substitute commercial pesto, make sure to re-calculate the Points Plus. You may not need the olive oil as many commercial pesto’s are a bit oilier than my Lightened Up version. The purpose of the oil is to help the pesto spread and easily coat the shrimp. For a dairy free and Whole30 version, use my Paleo Pesto. These store great. Feel free to make early in the day of the evening you plan to serve them. Just leave the chopped herbs off and top right before plating. If some of the peppers don’t rest flat on your counter or serving tray, turn them over and carefully slice a thin, lengthwise slice off the bottom where they should rest flat. Do this while trimming the ribs and seeds and before stuffing and be sure not to slice so much that you open the cavity of the bottom. I took photos of this step for you but they came out blurry so I hope these instructions make sense. For what its worth, I only had to do this to 5 of the 24 I made. Begin by preparing the baby sweet peppers. Clean and slice in half lengthwise splitting the green stems and leaving in tact. This makes them easy to pick up and nice for presentation. Take a paring knife and gently trim out the white ribs and seeds. Rinse and set aside to dry. Spoon a bit of the filling into each pepper half so that they have a slight mound and the filling isn't flat. Refrigerate covered until read to serve. Top with fresh chopped basil or parsley, serve and Enjoy! Do you think it would be ok to make the filling several days ahead of time and refrigerate until ready to fill and serve? Hi Terri! I would make the pesto in advance to save time and then mix the filling together right before serving so it stays nice and bright green! Pesto has a tendency to turn dark brown when it sits and the basil gets oxidized. these look perfectly delicious. thank you so much for the idea. in love the lil bell peppers. Hope you loved them Michelle! I love your attention to sustainability. I know that wild Oregon shrimp is the sustainable kind and I need to seek it out– I’m nearby in the Seattle area. I just plain haven’t bought shrimp in years, partly due to the sustainability issue. This looks right up my alley for a party appetizer: light, produce-rich, and finger food. I lighten my pesto, too, and like it that way. Still plenty flavorful, just less oily. 1 point! I love it. You are right… party food always seems to be fattening. This is a perfect solution. YUM these look delish! I love appetizers like this. Full of flavor and it’s sure to please a crowd. Glad I stopped by. Beautiful dish! And I’ll bet they taste wonderful – certainly that ingredients list has my mouth watering. Really good stuff – thanks. Love those baby bell peppers, they are so cute and versatile. Your shrimp filling looks delicious, am sure it was a hit. These little treats are beautiful, Alyssa! Love how they’re lightened up without sacrificing flavor. 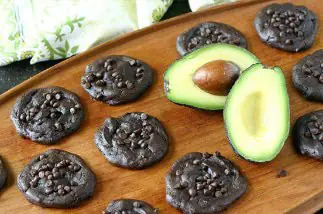 My dad makes something similar but I’m sure his version isn’t as healthy, lol — I’m going to print your recipe for him! I hope he loves them Faith! the shrimp and pesto filling sounds incredible! these would be really perfect to serve a crowd. They went over really well! I will definitely be pulling them out again soon with all the holiday parties coming! Glad I have a number of baby pepper plants already flowering in the garden 🙂 ! What a lovely dish – also I can see myself using that prawn/pesto mix in a number of other ways, even rolled up with salad in a flatbread!! I love appetizers. These look amazing, I’m loving the shrimp and pesto combo! Me too Laura – I never get sick of creating appetizers! As the VERY lucky recipient of these I can fully assure that they are freaking delicious. I will definitely make these again…and again…and again. Thanks CJ – they are delicious little bites!